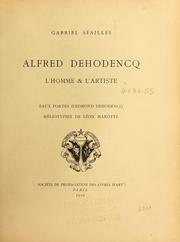 1 edition of Alfred Dehodencq found in the catalog. Add another edition? Are you sure you want to remove Alfred Dehodencq from your list? Published 1910 by Société de Propagation des Livres d'Art in Paris . Catalogue des œuvres, p. 187-201. No. 38 of an edition of 600 copies. Contains a Discours by T. de Banville which is catalogued separately. October 31, 2011 Created by ImportBot Initial record created, from Internet Archive item record.